Melbourne is a music town. Just wandering the streets at night you can hear bands bursting through the walls of pubs, acoustic sessions wafting out of small bars, or CBD buskers so good you understand how someone like Tash Sultana went from playing Bourke Street Mall to headlining the Sidney Myer Music Bowl in a couple of years. In November that gig-city reputation gets dialled up to 11 with Melbourne Music Week (November 16-24; melbourne.vic.gov.au), a celebration of the city's role as a maker of music careers. 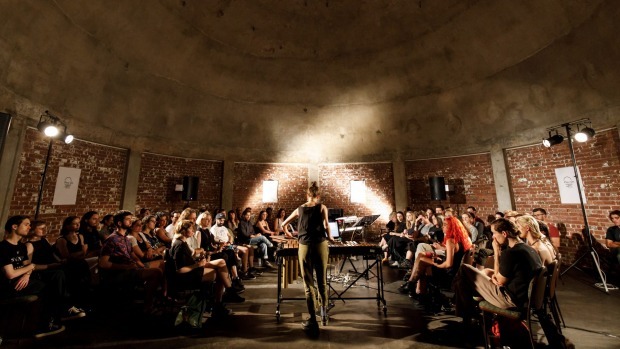 Melbourne Music Week is a shot in the arm to the already thriving music scene, making sure no one takes the city's many live music options for granted. With the Australian Centre for the Moving Image (ACMI) acting as the hub it is a week-plus of DJs, bands and happenings. "As far as I'm concerned Melbourne Music Week runs for 52 weeks of the year," says Cherry Bar owner James Young. "At Cherry alone we book over 1100 Melbourne bands in a year, and that doesn't include the number we knock back because they are not quite ready, so it's a very busy scene. If you come on a Saturday to the matinee show at 1pm you could stay all day and night till 5am, so you could do 16 hours at the one venue." The signature event at Melbourne Music Week is the Thursday night live music safari where the City of Melbourne picks up the tab for every venue in the city to have bands on and punters can pinball between venues for free, all night. But you can have a safari any night of the week in Melbourne, so I am spending a regular Saturday on a self-curated safari – accompanied by rock comrades Adolfo and Abraham – cramming in as much live music as I can. Like any safari, quality sightings cannot be guaranteed, and expect the unexpected. Our starting point is the Retreat Hotel in Brunswick (280 Sydney Road, Brunswick; retreathotelbrunswick.com.au), a north Melbourne suburb with more songwriters per capita than any other address in Australia. The Retreat is exactly the sort of pub that Sydney has killed off, a shabby-chic rock joint in the vein of the old Annandale or the Sando (both RIP), and the sort of place that I love. Why? Is it the guy playing pool in a gold lame jacket and matching golden shoes? Is the Wild West-themed stage sharing a room with a mural of the Greek Islands and historic rock posters? Is it the toilet that gets a 9/10 on the rock bathroom scale due to the black-and-white wallpaper featuring Johnny Cash and Mick Jagger and rock stickers on every available surface? Is it the fact there is a vending machine that sells guitar strings, string winders and pliers? Or is it arriving at 6pm to beautiful three-part harmonies as local band Tuckshop take the stage playing songs that were finished just days before and nailing a cover of Sia's Chandelier? The safari is off to a good start. Adolfo wants to check out Whole Lotta Love (524 Lygon Street, Brunswick East; wholelottalovebar.com; rock toilet rating 6/10, too clean, too light), another Brunswick joint with Led Zeppelin wallpaper to match its name. It's a quirky corner space where the band has to play louder than the trams that rumble past, but that is not a problem for our first act, a hard-rock covers band sporting AFL shirts and reading lyrics from an iPhone. But they are tight as a pair of Robert Plant's trousers and a lot of fun. We don't catch their name, but they are supporting Cash an all-girl "pout-rock" outfit that command the stage that is decorated with underwear taped to the wall. We stay for one more beer and then jump a tram headed to the city. Our next stop is the Tote (67-71 Johnston Street, Collingwood; thetotehotel.com; rock toilet rating: 10/10 special mention for exposed plumbing) that has become the lightning rod for Melbourne's live music scene. 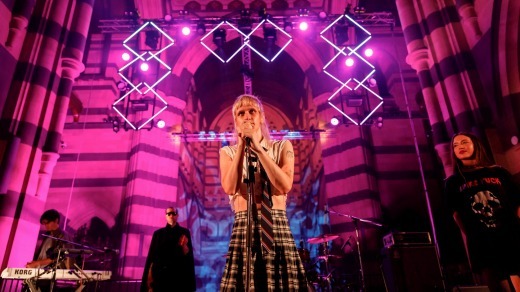 In 2010, the government attempted to change licensing laws to adversely affect live venues, with many like the Tote facing closure. Melbourne said no, and up to 20,000 people hit the streets and the government backed down. The Tote is now doing its thing with two floors of music most nights of the week. The place feels like it is held together by the ageing rock posters; a faded Kim Salmon & the Surrealists holding the ceiling up and the Powder Monkeys keeping the walls together. We catch a few songs from rockers Personal Touch, then hit the pavement for our next stop. As we wander around Fitzroy, music is not hard to find; we pass two pubs with live bands and stop to listen to a busker outside Woolworths that would not be out of place on stage. Our destination is Yah Yah's (99 Smith Street, Fitzroy; yahyahs.com.au; rock toilet rating, 8/10 more space for rock stickers), club downstairs, band room upstairs and arrive in time for a few puffs of dry ice and the start of a set from Hot Sludge Fundae. The band seems to be bringing sax back with a retro groove that harks back to early Talking Heads. The room fills quickly and the lead single of their triple J Unearthed page Sunshine turns into a group singalong. By the time we leave the queue is snaked around the corner. Yah Yah's is the sister bar to Cherry Bar (AC/DC La, Melbourne; cherrybar.com.au; rock toilet rating 9/10), Melbourne's most rock'n'roll address and our final stop for this mini rock safari. Cherry Bar has live music 365 nights a year with local acts making up the majority of bookings. This is the bar that the Foo Fighters hang out in, that refused to cancel a local Melbourne band for Lady Gaga, the bar that erected a statue of Bon Scott this year on the side of the building. AC/DC Lane itself is one giant mural to music with references to the Who and deceased AC/DC guitarist Malcolm Young. Each year Cherry Bar owner James Young collaborates with street artist Makatron to cover the lane from head to toe. Cherry Bar is the only business in this famous lane and only has room for 200 punters at a time. Like any good rock'n'roll bar the walls are far less important than the crowd and a dash of punk spirit. The vibe is louche but not self consciously so, with the Jenni Bar at the rear providing a nook to chat. As we pay the cover the woman on the door gives us some respect for our arms covered in the stamps of the previous venues. Our tour tonight has been select, but random, the only constant though is quality. Every band tonight has been of a standard only seen in a city that has a deep and rich music scene. There are plenty of opportunities to strut your stuff in Melbourne, but you need to be good because there are plenty of other bands that want a shot at the title. Our final band in Cherry, Child, from the Melbourne suburbs, sling a heavy blues reminiscent of early Page and Plant. The three-piece has Cherry hanging on every high note the light from the stage making silhouettes of the tightly packed crowd. The whole safari has been a hit but Child are the Big Five all rolled into one, so we sink a final beer and head home knowing we can do it again – just about any night of the week. 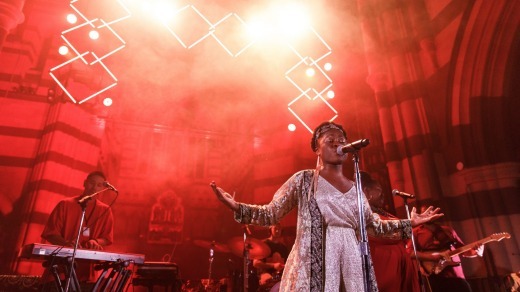 What council is trying to do is create an environment where every turn in the middle of the city you are having a musical experience and November is going to be the time for live music in Melbourne. 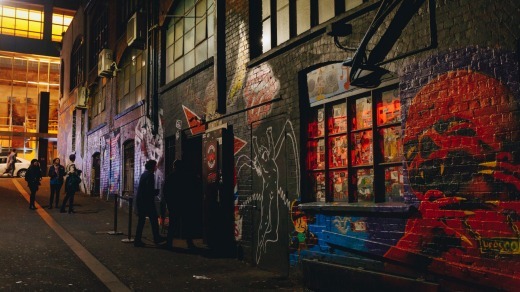 On Thursday, Melbourne's inner city live music venues throw out the cover charge and throw open the doors so you can wander between venues and check out as many new acts as you can squeeze into one night. The signature event of the week, November 22; Melbourne CBD. This is actually the first time these Australian veterans have played the music week and they debut in style by playing the Melbourne Town Hall incorporating the famous Grand Organ into their rock classics. November 18; Melbourne city. A satellite event, the Dark Space Project turns out the lights at CBD bar Toff in Town for some immersive DJ sets from the likes of James Teague and Hextape. November 18; Toff in Town. This hub event brings together some of the best female voices in Australian music with Renee Geyer, part-time member of the Bamboos, Kylie Auldist and Chelsea Wilson. November 20; ACMI. Paul Chai travelled at his own expense.